Part of the problem with trying 43 New-to-Me foods is identifying them and then finding them. I've been asking friends for suggestions, googling like crazy ("weird foods I should try" or "unusual fruit" or "vegetables you haven't heard of" etc. ), writing down potential items while watching Food Network and visiting a variety of ethnic markets. I found what would become #2 on my list of 43 New-to-Me at a gas station mini mart. I'd been trying to track down a particular regional soda I wanted to try that wasn't common here. Their website said the mini mart sold it. As it turns out, they did not. But they did have something I've never seen before: Sunkist Pineapple soda. 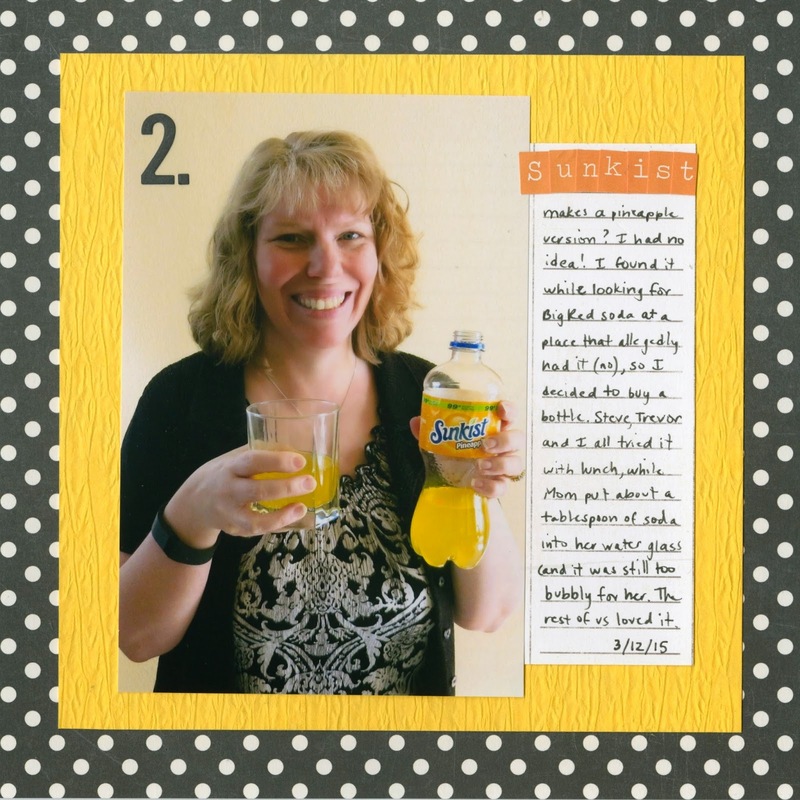 I didn't realize there was any Sunkist besides the delicious (and ubiquitous) orange soda. I bought the Sunkist Pineapple. Yum! It was excellent! I gave it a 9 out of 10. It had a good pineapple flavor that didn't taste too artificial and the sweetness was just right. 43 New-to-Me is off to a delicious start! It sounds YUMMY!!! LOVING the colors on your page .... perfect for the drink!!!!! I may have to pick up another bottle so I can try it with rum! Sounds good! That sounds good- I've never seen it before. It sounds yummy! Glad you found something to add to your list! Bunny Week, Day 5: Let's Hop!